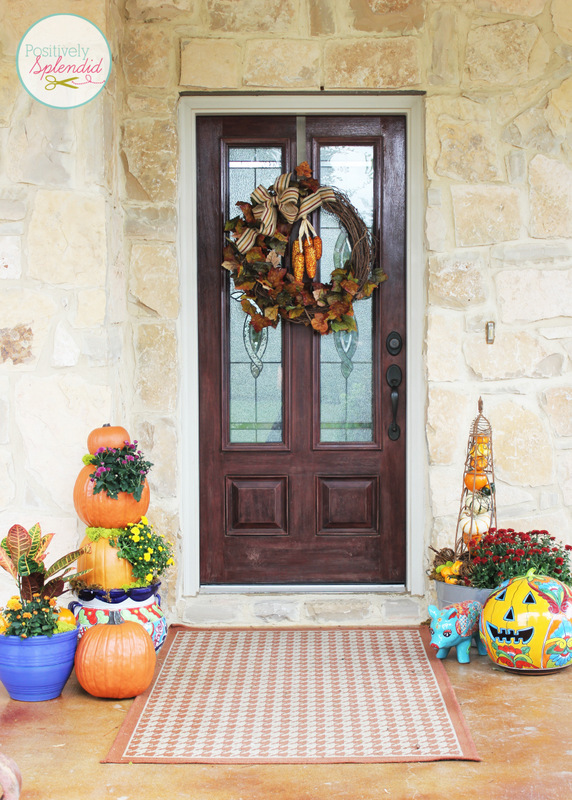 Decorating outdoor spaces, including porches, patios and more, is a great way to add a touch of seasonal flair to your home. 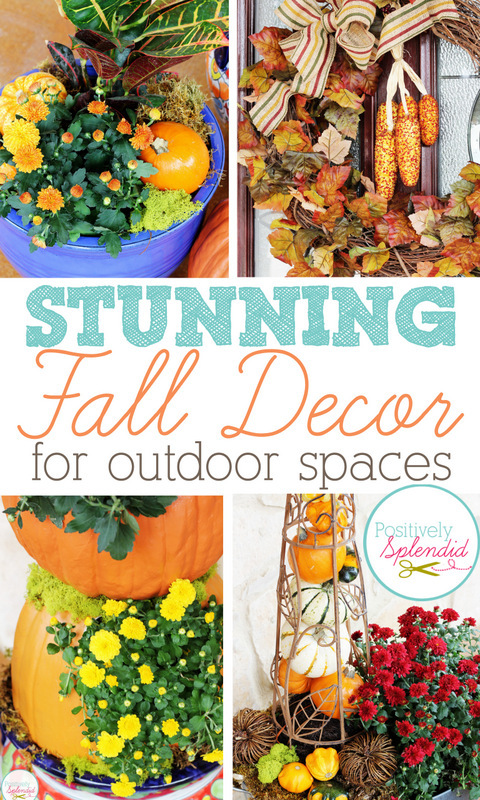 Fall is a perfect time to showcase an abundance of rich, vibrant color in your outdoor decorating, with pumpkins, gourds, mums and other natural elements that are readily available during the autumn season. 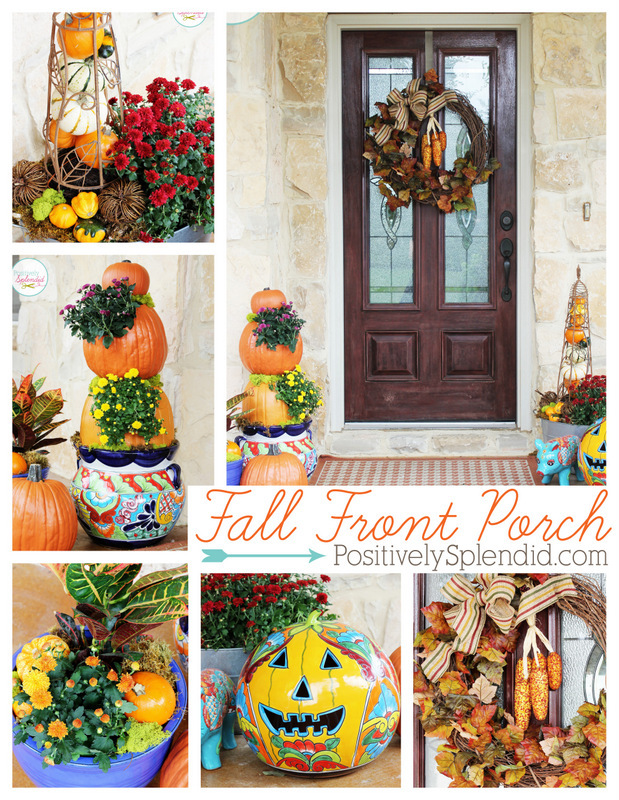 Today I’m sharing how my fall front porch came together. Let me give you the full tour! My springboard for this entire display was a fantastic Talavera-style ceramic pumpkin that I found at H-E-B, a regional Texas grocery chain. I loved the way the bold colors in the painted details on the pumpkin were so fitting of fall, even though they weren’t the typical muted hues most often associated with the season. Some of my best decorating advice: Don’t feel like you always have to use the traditional color scheme for a season in order to “follow the rules.” If you prefer to use a different color scheme that the standard, I say go for it! 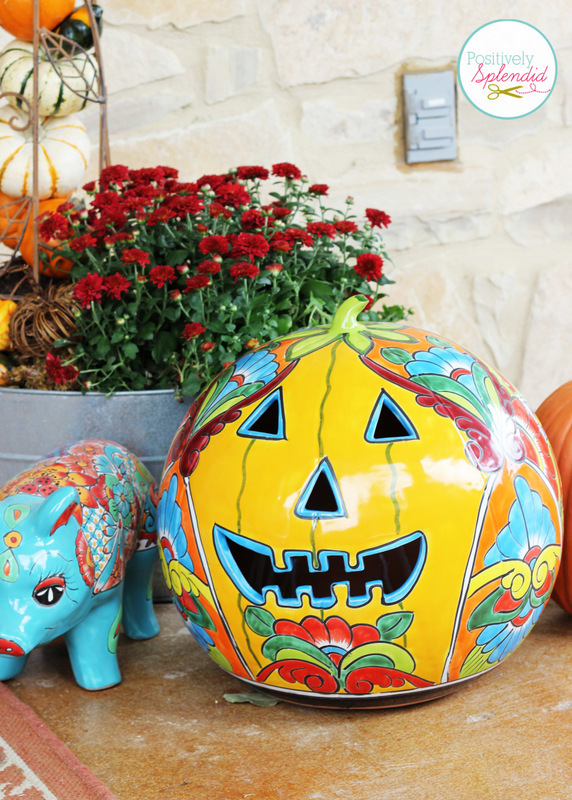 I love how the painted pumpkin, along with his little pig sidekick that I purchased at HomeGoods last year, adds such a whimsical touch to the entire scene! 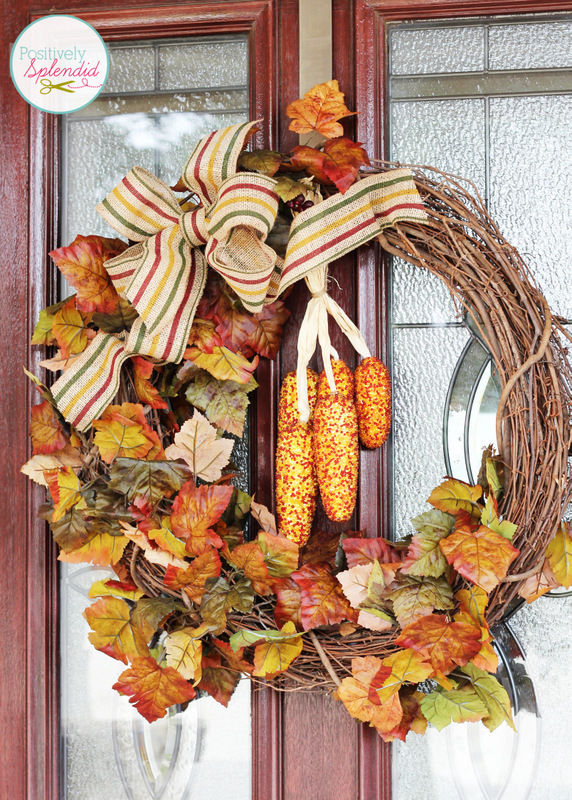 Even if you don’t have an abundance of available outdoor space, wreaths are a terrific way to add a seasonal touch to a front door. This wreath, which was literally made in 10 minutes, utilized only four supplies, all of which I already had on hand. The full details for how this came together will be coming up soon, so stay tuned. 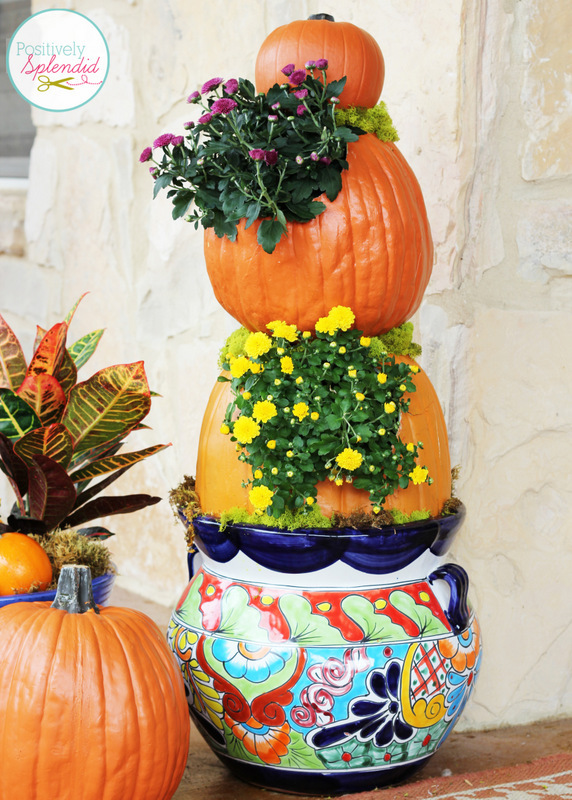 Without a doubt, my favorite element in my fall front porch this year is my stacked pumpkin planter, which is made with faux pumpkins and gorgeous seasonal flowers. You can find the complete how-to for this project in my Stacked Pumpkin Planter post. 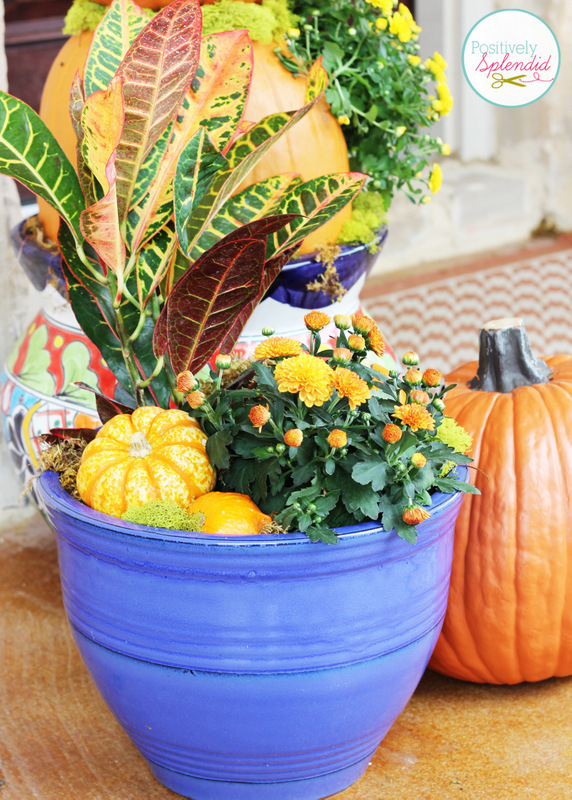 Alongside the stacked planter is a smaller arrangement displayed in a cobalt blue pot. 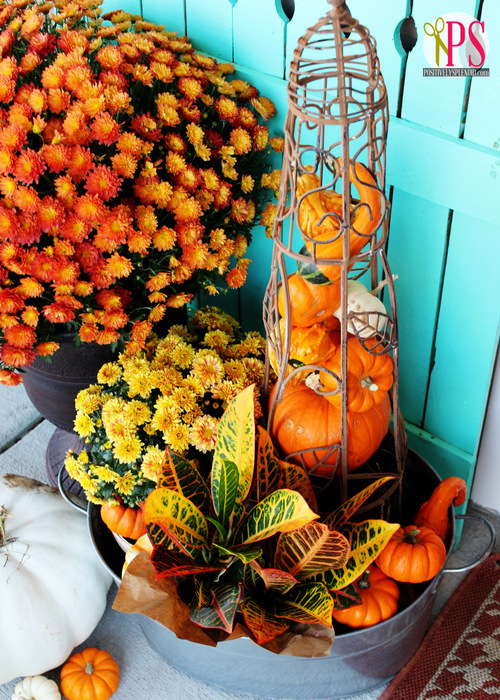 Blue might seem like an unusual addition to a fall display like this one, but because blue and orange are complementary colors on the color wheel, deep blues like this are a match made in heaven with bright orange pumpkins! 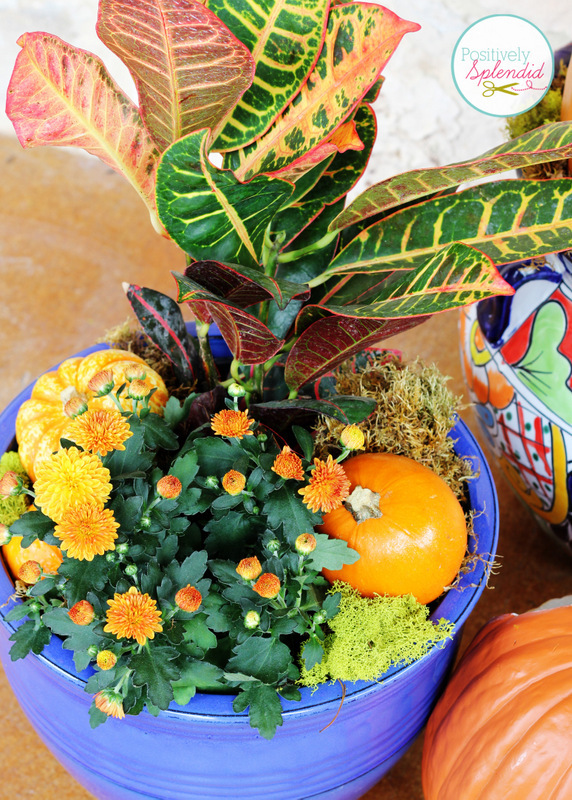 Inside the pot are a croton, an orange mum, and some miniature pumpkins and gourds, along with a bit of decorative moss for good measure. Instead of planting the croton and mum directly in the pot, I opted to leave them in their original containers to make it super easy to switch out the display later on. 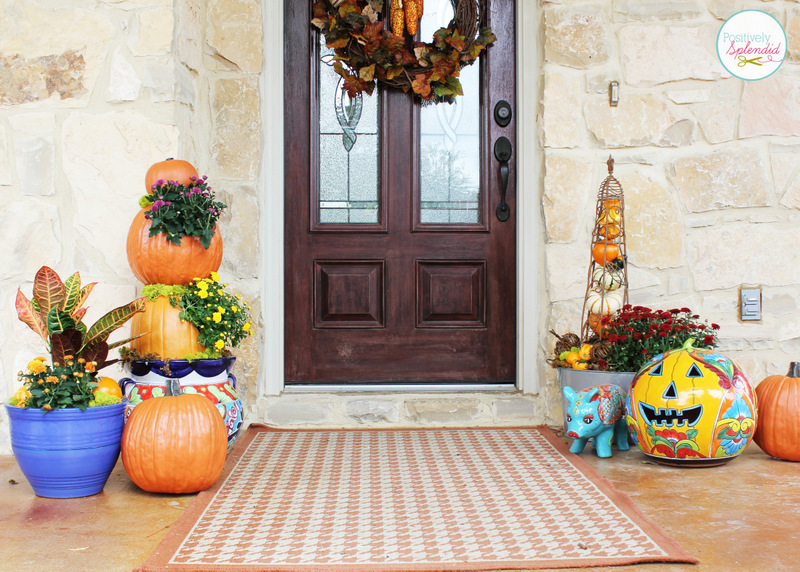 On the opposite side of the door is my pumpkin topiary made with a garden obelisk and a galvanized bucket usually used for icing down beverages. (Mr. Splendid let me borrow it, even though tailgating season is in full swing–what a guy!) This display makes an impressive statement, yet it is so easy to do. 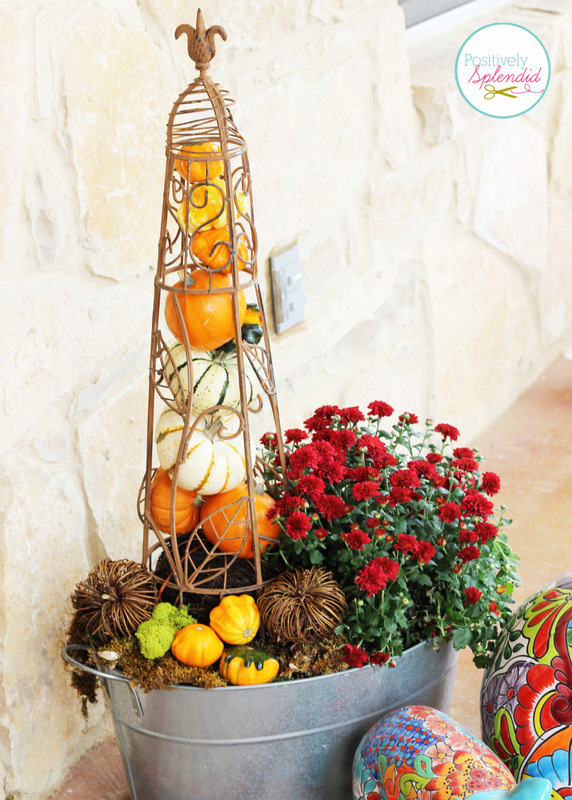 To put it together, I turned the obelisk upside down to fill it with small pumpkins and gourds, and then I tightly squeezed two vine and twig pumpkins into the bottom to act as “stoppers” as I flipped the entire thing over to place into my bucket. I rounded out the rest of the arrangement with a lovely red mum, more miniature gourds, twig pumpkins and decorative moss. This entire scene makes my heart so happy! Fall is my favorite time of the year, without a doubt. 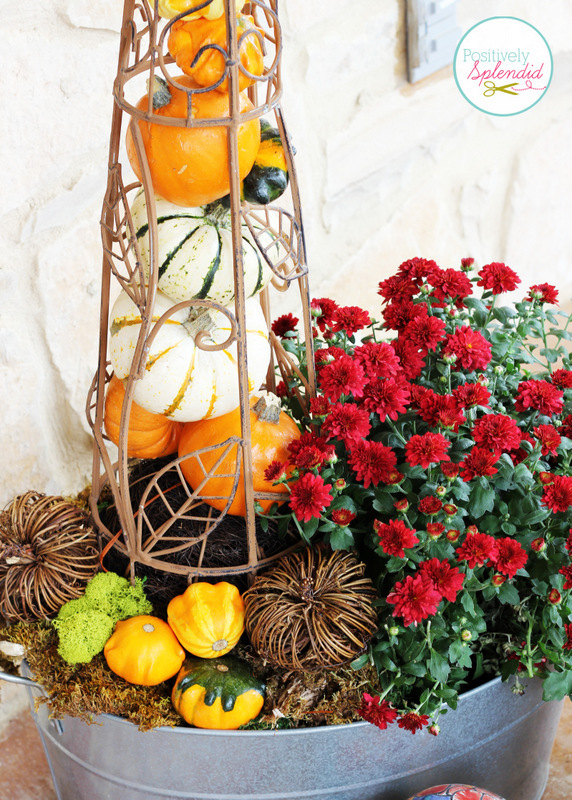 For even more outdoor inspiration, be sure to check out my creative outdoor fall decor ideas from last year, including another version of my obelisk arrangement. And before you go, don’t forget to read a special note I’ve written just for my phenomenal readers, plus find out my top two pieces of creative advice. P.S. I’ve made tons of updates to the site design here at PS, adding new menus for easier exploring plus some new creative styling. If you are enjoying this post in a reader, I would love for you to stop by and tell me what you think! Love it!! It’s so festive and pretty. I’m loving the pig and pot you got from HEB (love the store). Everything looks so beautiful. It could be on the cover of Better Homes and Garden. Love it!! I love this arrangement you made. it makes my heart sing. Love that ceramic pumpkin.it’s so joyful. We don’t have the store you got it at here in Canada so I’ll have to just dream about having a front door welcome like this. a wonderful composition. Thank you so much for your gracious comment, Deb! Have a blessed day! by water pollution gizmo vegetatioln is extremely small. Benjamin Cummings, San Francisco, and we are also keeping the evasives out. This part of your unconscious called the adaptive unconscious.